Like many first-time gardeners, my humble backyard garden has produced more vegetables than I know what to do with! 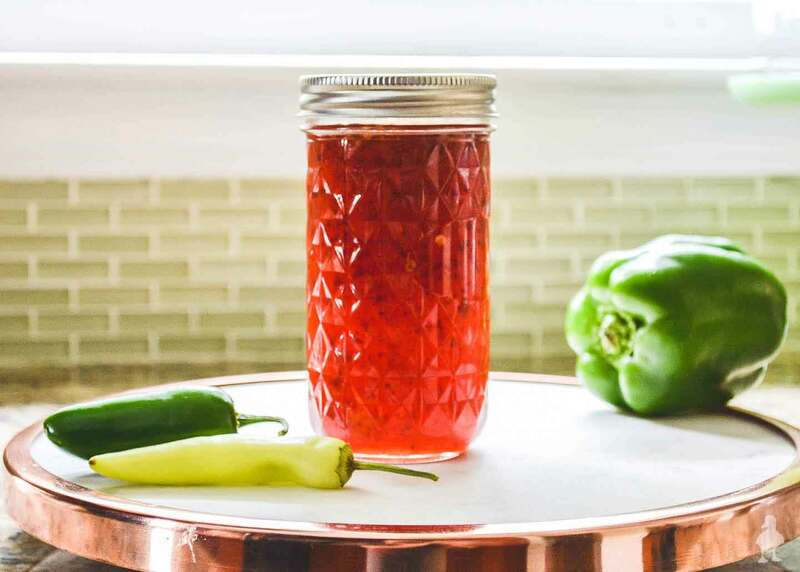 So, I spent last Saturday morning with Mom and learned to make hot pepper jelly using several pepper varieties from my vegetable garden: bell peppers, banana peppers, and jalapeños. I’m sure for the sake of accuracy, I should probably call this jam since we blended the pulp of the peppers and seeds to make it, and jelly is typically made with just the juice of something (or so the internet tells me). But jelly is what Mom calls it, so who am I going to believe? The process of learning to make jellies, jams, and preserves was a new experience for K and I during our visit. Mom walked us through the steps, equipment, sterilization methods, etc. 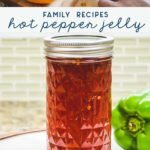 I’m working on a longer post about general rules of thumb for home canning, so be on the lookout for a separate walkthrough to cover those concepts in more detail. This post is meant mainly for the simple, straightforward recipe, but I have some very basic info here, too. In order to keep everything as uncontaminated as possible, things moved pretty quickly once it came off of the heat! 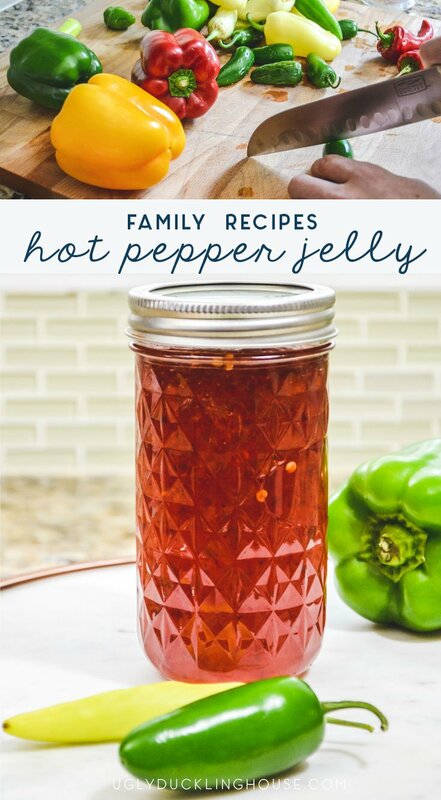 You’ll need to sterilize your jars before beginning, but Mom keeps them inside the dishwasher (still hot) until they are ready to use, and the lids/bands in a pot of hot water on the stovetop as we prepared the jelly. If you’re looking for a sweet n’ spicy appetizer with some extra kick, pour a generous helping of Mom’s hot pepper jelly on softened cream cheese, then snarf it down with crackers. It’s great for holidays and parties, too! Sterilize canning jars, lids, and bands according to manufacturer’s instructions. Fill a large pot with water and heat it up on the stove. 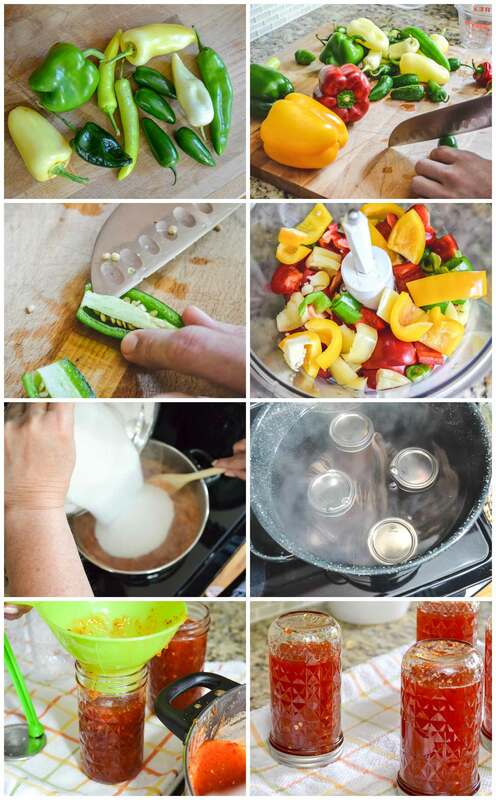 Chop peppers into chunks. For less heat, remove seeds (we removed half of the jalapeño seeds in this batch). Put all chopped pieces in blender and blend until there are no large chunks. Place pepper blend in a large saucepan over high heat, stirring constantly. Add vinegar and pectin and continue stirring until the mixture is at a full rolling boil. Add sugar and stir, returning to a full roiling boil for exactly 1 minute. Remove from heat and skim off any foam with a spoon. Ladle jelly into jars up to 1/4 inch from the top. Cover with lids and bands; screw on tight. Place jars into canning pot, either on canning rack (slowly lower it into the pot) or (in Mom’s case) with a dish towel on the bottom of the pot to keep the jars from touching. The water should cover the jars and be hot, but not boiling. Bring water to a boil and let process for 5 minutes. 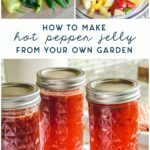 To prevent the seeds from settling on the bottom, flip the jars over for about five minutes while the jelly begins to cool. Turn them right side up to cool for the rest. You might hear pops from the lids forming a vacuum as the jelly cools. After 12 – 24 hours of cooling, remove the bands and push your finger down on the lids. If the lid still looks like it has a bump and/or flexes when you push down, the lid is unsealed and needs to be immediately stored in the fridge or reprocessed. Prepare and sterilize your jars, lids, and bands ahead of time. Here’s a more extensive post on the subject. 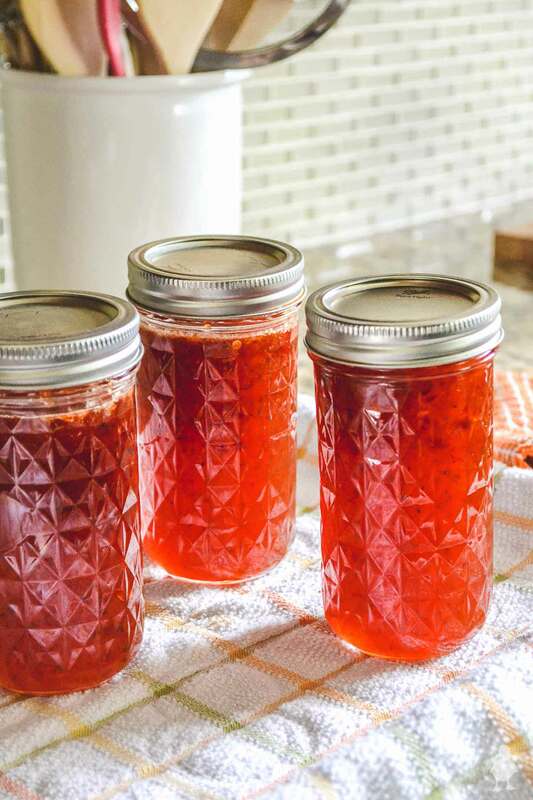 Homemade jelly is meant for small batches; doubling up the recipe can mess with the pectin and cause the jelly not to set properly. If you don’t hear the jelly lid pop, or if you test the lid and it isn’t sealed properly, you can change the lid and reprocess it or immediately put it in the fridge and eat. It will keep for about a week with the lid on in the fridge. Jelly/jam that’s unopened can last for up to two years if it’s given a proper water bath. Once opened, you can store it in the fridge for up to three months (I’ve read six months online as well, but I’m not sure about that). Don’t forget to pin it to save for later! Looks like you used several colors of bell peppers – does it matter? I don’t really like green ones – much prefer red ones (and the orange and yellow are pretty good also). 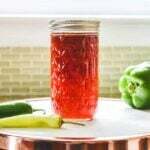 We love hot pepper jelly so I’ll be giving your recipe a try once we get settled in a new house and have a garden. 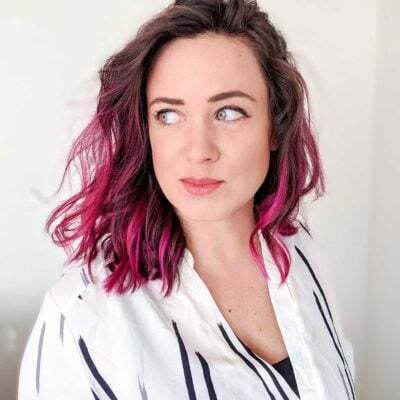 A great blog for canning advice is Food In Jars by Marisa McClellan – she’s written several canning cookbooks so stays up-to-date on best practices and shares many recipes on her website along with how-to, tips and things to do with what you made. Thanks for the blog info, Cheryl! I think the only thing it would probably impact is taste. I assume the red/yellow/orange ones are more acidic, but I’m like you and much prefer the red ones.